Many thanks to the Rotary Club of Town Center Virginia Beach for inviting us to share an exquisite holiday meal at Atlantic Shores Retirement Community! Members enjoyed food, drinks, caroling and prizes. Notably, Town Center President, Pat Edwards, gifted each person present with a green light bulb as a way to highlight the dire need for increased awareness and care for people living with mental illness. Learn more about mental illness and how you can help (or get help), by visiting the National Alliance for Mental Illness website. Today we welcomed residents of the Tidewater Youth Services Commission Crisis Home to join us for dinner. It is always so enjoyable to learn about the goals and passions of these resilient youth. Today we were joined for dinner by 20 of the 23 Brickell Scholars (click here to learn more). These young men and women from all 11 Virginia Beach City Public High Schools and the Collegiate Academy had earlier in the evening met with Dan Edwards to receive an orientation on the Brickell program, Rotary, and learn about the series of seminars they will participate in. Following dinner, each of the scholars introduced themselves. To say that it was a bright group of overachieving young men and women is an understatement! We learned that they were planning on attending the following list of impressive institutions following their graduation from high school: Duke, UNC, UVA, Georgetown, Ohio State, Virginia Tech, Yale, MIT, Carnegie Melon, The College of William & Mary, George Washington, JMU, Princeton, Boston College, Dartmouth, University of Pennsylvania, Georgia Tech, the United States Naval Academy, Brown University, VMI, and Washington University. They had the following list of academic majors: Pre-Med, Business, International Politics, Environmental Engineering, Journalism, Mathematics, Biology, Micro-Biology, Mechanical Engineering, Aerospace Engineering, and Health Care Administration. Chelsea Mandello, the Founder and CEO of Troopster, spoke about the organization's work to provide personalized military care packages as well as donation packages to troops who are deployed or stationed away from home. Founded Thanksgiving Day 2015, Troopster is operated by current active duty Navy Petty Officer Chelsea Mandello. It was during a difficult deployment that the idea of helping friends and family send care packages first began. Chelsea was serving on board her seventh ship in the Mediterranean and noticed that the few individuals who received care packages were rarely able to use or eat the contents inside. She wanted to help not only simplify the tedious task of sending care packages, but also give an option for those who don’t have family to still receive care packs. Two years after the initial idea of Troopster, Chelsea, while still serving in the Armed Forces, launched Troopster. The first, easy-to- use, personalized option to send care packages to military. We are proud to say that it has grown from a small business that provides personalized packs to a company that has sent more than 600 care packages to deployed troops. Each year, the Virginia Beach Rotary Club honors an individual with a disability who proves an exceptional and dedicated employee, and an employer that proves their commitment to inclusivity by employing individuals with a disability. Today we honored Irving Ferguson with the 2017 Special Achievement Award, and Walgreens Store #7133 with the 2017 Doors of Opportunity Award. 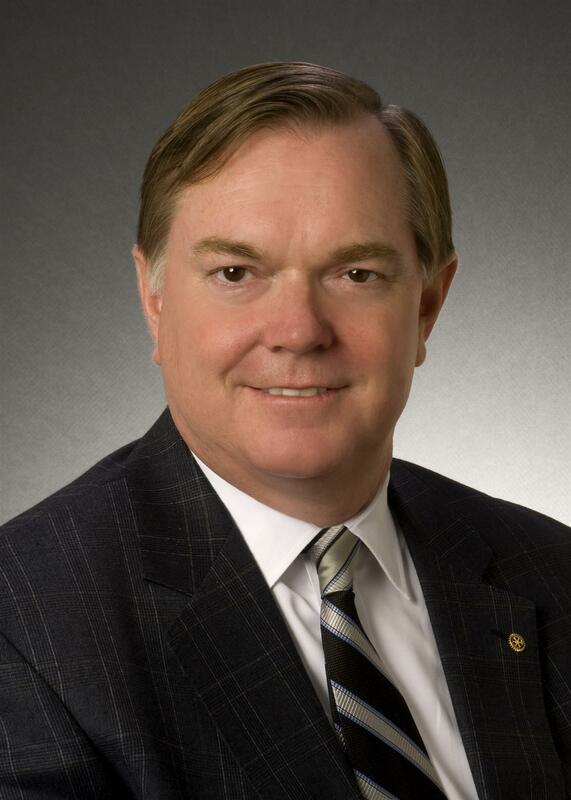 Walgreens Store #7133 is managed by Mr. Andy Childress. Andy was not able to be at the meeting but his Assistant Manager, Reathel Ingram, and her daughter Lila were at the meeting to accept the award. The nomination letter spoke of Andy’s supportive and understanding demeanor over the past 10 years working with clients with disabilities. Irving Ferguson was joined at the meeting with his mother, step father, and Job Coach, Kara Bullard. Irving’s nomination letter spoke to his keen customer service and problem solving skills he developed working for the Tricare Primary Military Clinic in Virginia Beach as an ID checker. Irving is also involved in wheelchair soccer, waterskiing, and practicing Aikido at the Princess Anne Recreation Center. Also in attendance at the meeting were Todd Condron and Krista Shanafelt, both employees at the Virginia Beach Community Employment Options office of the Department of Human Services. We had the great fortune of hearing from Season Roberts, Executive Director of Virginia Beach CASA (Court Appointed Special Advocates). CASA aligns trained volunteers with children involved in child abuse cases to advocate for their needs and make recommendations based on their individual circumstances. 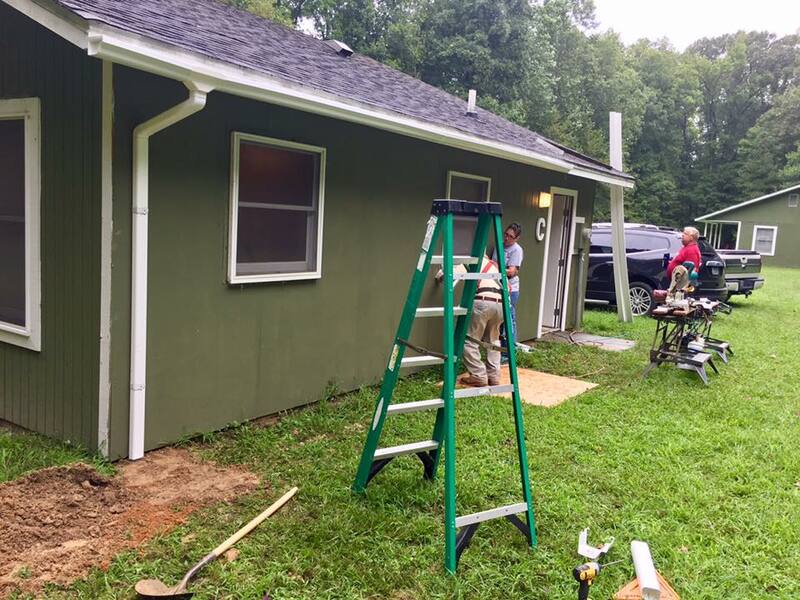 Each city in South Hampton Roads has a dedicated CASA for its youth. This is a crucial service both for the children and their families. Learn how you can become a volunteer by clicking here. Rex Haymaker, co-owner of Taste Virginia Tours, shared the fun opportunities he and wife Lisa offer to tourists and locals alike. As life-long locals, they strive to create an experience to show people the best food, brews and wines the area has to offer. Rex and Lisa are heavily involved in the local food movement through their own nonprofit, Hunger for Health. Dedicated to all things local, Taste Virginia Tours take you safely from farms to restaurants to wineries, breweries and distilleries. You are able to choose from their set tours or contact them to put together a custom tour for your group. All of their tours can be customized from their partner venues on their regular route to fit our group’s needs. By selling beer at this year's Neptune Festival, we raised $3,671.73 for our Foundation account, which will go back into the community through grants to worthy nonprofits! Thanks to all members, and special thanks to friends and family who helped make this year a success! What an exciting Conference for District 7600! Read more on the District's Facebook page. were referred to by the settlers as Pipsico. Chief Pipsico assisted settlers by providing them with food and training them to raise and manage indigenous crops, such as corn. Pipsico Scout Reservation encompasses 916 acres of woodland, open fields and marshes. The terrain includes a natural ravine system and ranges in elevation from 20 to more than 100 feet above sea level. Pipsico Scout Reservation’s northern boundary extends for a mile and half along the banks of the historic James River. District Governor John Padgett began his presentation by setting the stage for boredom. He lightheartedly told stories of Rotarians near and far dreading the annual visit from the District Governor, expected to be a presentation full of typical advice on membership, fundraising, and community service. Well Mr. Padgett sure fooled us! His talk was an inspiring version of the "Rotary Story." One, he says, we don't do a very good job of telling. The point was driven home that anyone and everyone can play a part in making the world a better place, and Rotary offers a global community platform to do so. Learn more about what Rotary has done to End Polio Now, Promote Peace Worldwide, Save Mothers and Children, and much more! Many thanks to District Governor, John Padgett, and his inspiring story that made us all feel proud to be Rotarians! With a background of crashing waves and sea mist at the 31st Street Stage, members danced to classic rock 'n roll songs performed by Symphonicity. 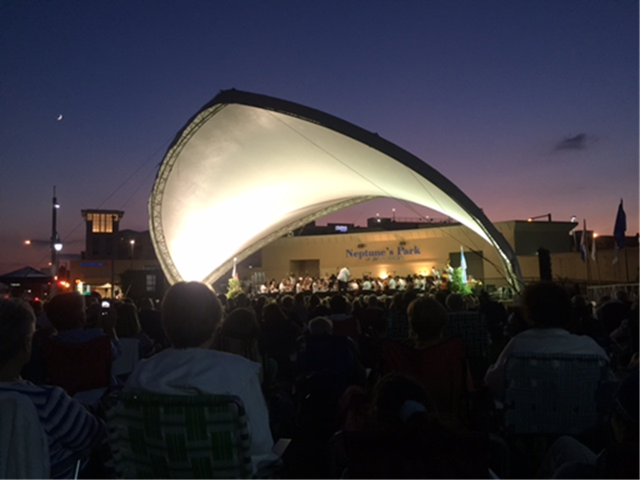 Yes, the Virginia Beach symphony played the Beatles! It was a lovely time with many members and guests, accompanied by a beautiful crescent moon. Surely a night to remember. A lovely night out on the town! After a scrumptious meal at Croc's 19th Street Bistro, members relocated to the Virginia Museum of Contemporary Art (MOCA), to enjoy a partnership with Story Exchange, "a community engagement project where shared human experiences are told through art." 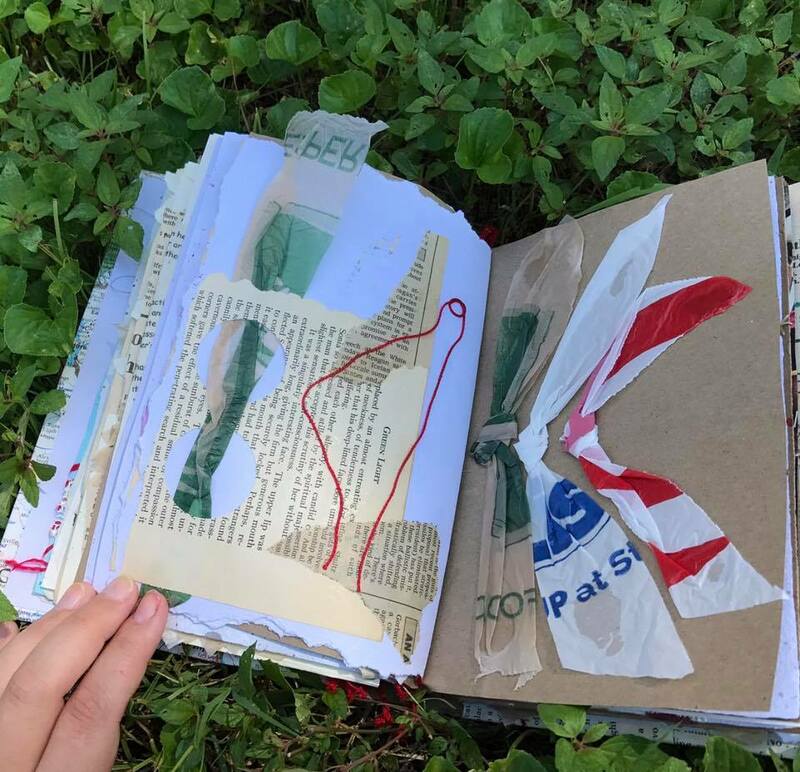 The collaboration provided a platform for community members to share their personal stories of inspiration, followed by visual and performing artists creating a piece inspired by those stories. It was touching, raw, and inspiring in many ways. 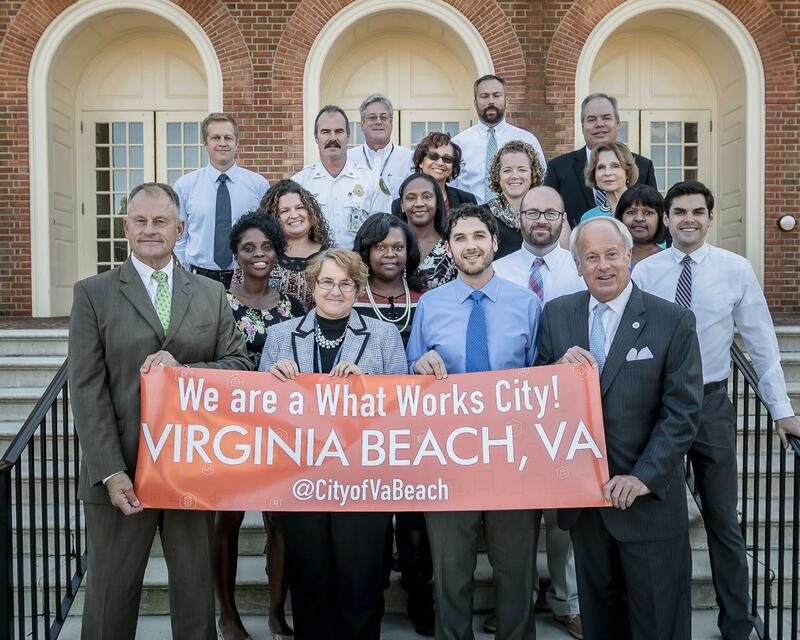 Catheryn Whitesell, Chief Solutions Officer for the City of Virginia Beach, talked about the City's new Office of Strategy, Transparency, Innovation, and Resiliency (STiR). She was recently appointed to this new position as part of the City’s participation in the Bloomberg Philanthropy’s “What Works” Cities Program. The City is one of 55 nationwide that are participating in the program. The program provides the City with free access to experts from Johns Hopkins Center for Government Excellence, the Harvard Kennedy School, and the Sunlight Foundation. Catheryn talked about the new open data portal that the city now uses to inform both City Council and all citizens. She also talked about the work with City Council to revisit their goals and focus areas. Finally she spoke about changing the culture among employees to encourage new thinking, solutions, and the way they work together. Several club members, as well as many other Rotarians from District 7600 wore their red "End Polio Now" t-shirts to the Norfolk Tides vs. the Scranton/Wilkes-Barre Rail Riders baseball game. Also included were residential youth from Tidewater Youth Services. Mike Yastrzemski of the Norfolk Tides reached base safely four times and scored three runs to help the Tides win 3-2! President Linda led an informative business meeting outlining some of her plans for the new Rotary year. 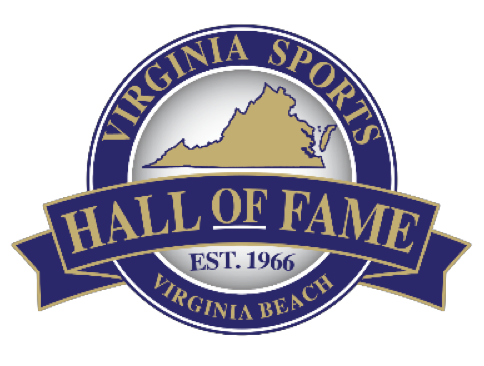 Will Driscoll, Director of Sales for Virginia Sports Hall of Fame, presented the plan for moving forward with the organization. The hall has closed its location in Portsmouth and is in the process of relocating, in a new format, to Virginia Beach. The hall began as a concept and traveling program in 1966, before securing a "home" in Portsmouth in 1972. In 2000, a $12.5 million facility was built in downtown Portsmouth, though over the years both funding and visitors decreased, leading to the exploration of other options. The City of Virginia Beach became the preferred option, proposing a new concept that involves placing the collection in several building lobbies in Town Center. The Hall saw that Town Center had the population density, the right kind of people demographics, and was a preferred destination by many tourists visiting the area. This, coupled with a City that has a more robust support system for entertainment and tourist attractions, proved to be compelling reasons to move to Virginia Beach. What is envisioned is a collection that becomes an interactive walking tour of the Town Center area with Hall memorabilia located in the lobbies of the Clark Nexen Building, the Art Institute, BB&T Building, Armada Hoffler, Pembroke Mall, 249 Central Park Avenue, the Westin, and Zeider’s Community Theater—when it opens. The long term plans for the Hall is to reduce reliance on government subsidies, increase private sector support, and build an annual membership program that will provide its members with special benefits. Welcome VB Rotary Officers for the 2017-18 Year! Tonight we installed the following: President - Linda Griffin, President-Elect - Hearst Vann, Treasurer - Patti Phillips, Secretary - Michael Summers, Immediate Past President - Amy Kurtz, and committee chairs Jim May, Jennifer Kronenburg, Eva Poole, and Barbara Bradley. Welcome and cheers to a great start to a new year! Click here to read more about past meetings.